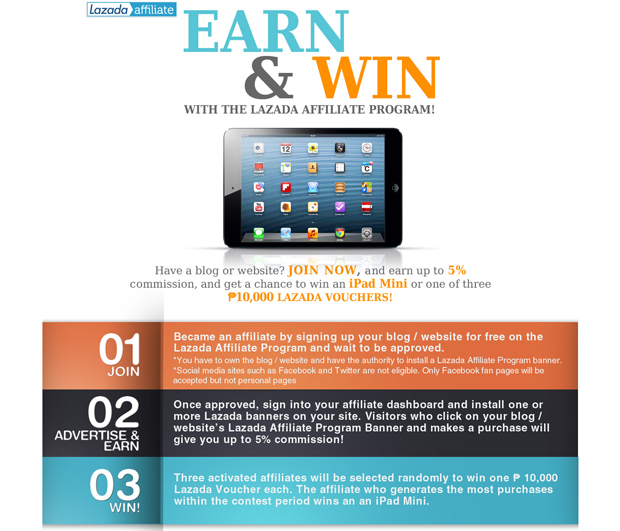 Earn & Win WITH THE LAZADA AFFILIATE PROGRAM! Eligibility: This raffle is open to Filipino residents who have a website or personal blog that has been active for more than three months. Employees of Lazada E-Services Inc. and its promotion agencies, including their relatives up to the second degree of consanguinity or affinity, are not eligible to join. All existing affiliates who have registered before the official contest period are eligible to join so long as they comply with previously mentioned conditions for eligibility.